St. John's Choir was founded in 1882, two years after the church's foundation in 1880. 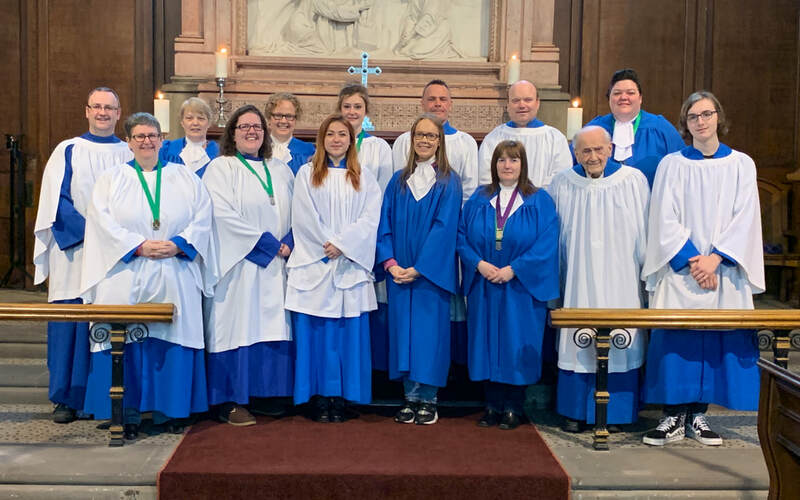 The choir is a mixed Adult and Junior choir and rehearse once a week. The Sunday Service is at 10.00am, and choir practice is Tuesday evening, 7.00pm - 8.30pm. The choir is also in demand locally. We sing regularly for military and other uniformed organisations throughout the year. We also socialise with trips out, as enjoying time together creates a good team atmosphere. All choristers undergo the discipline of a training scheme, set out by the Royal Schools of Church Music, and periodically medals are awarded in recognition of achievement. A musical background is not necessary, although it can be an advantage, and all training is given by the Director of Music. Many choristers have also achieved places in their desired secondary schools, with whom we have very good relations. Age is not restrictive, although good voice production starts from the age of about 7 - 8, and the ability to be a good, confident reader is extremely advantageous, as we sing in many different languages. Weddings are a bonus for choristers who have a good attendance record, as they are paid for singing at these occasions. RSCM Choir Festival Evensong: 8th May 2010.